Oil press machine or called oil expeller is designed to use physical mechanical pressing way to press oil out from the oil seeds. And the mechanical oil press machine is usually suitable for all kinds of raw material, such as peanut/groundnut, soybean, sunflower seed, corn germ, palm kernel, copra, mustard, cottonseed, castor, sesame, canola/rapeseed, flax seed, etc. Single machine capacity ranges from 10-200TPD. Why oil press machines from ABC Machinery are superior? The oil expeller is characterized by compact construction, high capacity, little floor-space occupation, durable service and easy operation. The amount of feeding, the process of oil yield and the thickness of cake can be readily ascertained at a glance. Their regulations, if necessary, can be satisfactorily made merely by manipulating the feeding regulating lever and the cone setting lever. All the reduction gears operate in oil and the whole surfaces of gear teeth are hardened by heat treatment. The worm shaft (or main shaft) of the oil expeller is made of high-quality alloy steel, thus ensuring long service life. The pressing worms and cage bars in the bar cage are also carburized, therefore, they are wearable and durable. 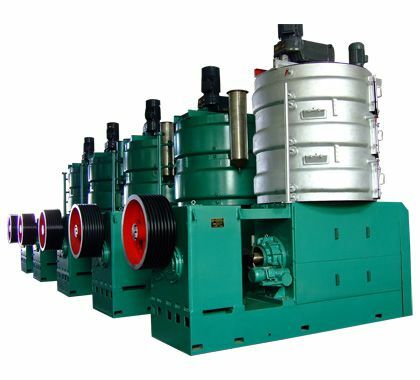 In order to suit the need for heating-up different seeds to varying temperatures for extracting higher quality oil, the oil press machine is provided with meal steaming and roasting equipment kettle which can heat up the above mentioned oil bearing seeds to an optimum temperature before being fed into the pressing cage. For the whole process of oil extraction, Please see below. The meal is fed through the inlet opening (1) into every stage of the steaming kettle (2), (3), (4) and is then gradually heated up and stirred by the stirrer. Blades from one stage to another. After being pushed out from the outlet (5) of the bottom stage, it drops into the feed head (6) and is delivered to the pressing cage (7) to be compressed by various sections of the pressing worms therein. The extracted oil flows through gaps between cage bars into the oil screw conveyor (8) and thence to an oil reservoir, whereas the cake is discharged at the rear of the machine. 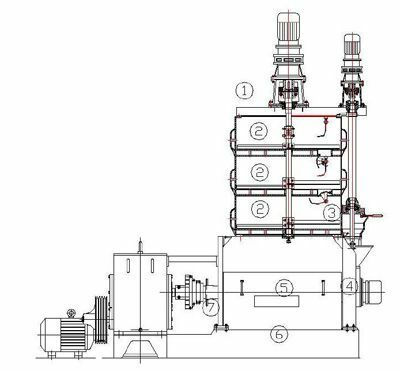 All this shows that the whole process of oil extraction, beginning from feeding, steaming, heating up to oil and cake discharging, is fully automatic and continuous. Therefore, when once the amount, the temperature and the moisture of seeds and the thickness of cake have been set, the operator needs only to observe the feed indicating pointer, steam pressure gauges and ammeter and make adjustment when necessary, thus minimizing the requirement of supervision and greatly saving labor.